Turn you homebrew enabled Wii into a full featured personal computer, with the installation of only two files. No special formatting or hardware required. Built with ease of use and the Wii's limited system resources as the bullet points. EWL begins with a Debian Squeeze core. Added to that is a selection of packages that fit the model. Finally many applications that aren't available in the Debian repository, where compiled specifically for this distribution. All of this is combined, to provide a seamlessly home computing experience, that can satisfy most needs. Step One: install the Linux disk image. Decompressed the archive contains one folder named "linux", which contains one file "linuxdsk.img"(1gb). Copy this folder to the root of a FAT 16 formated SD card. Step Two: install the executable kernel image. 1. Start the kernel from BootMii. Press the power button to move the BootMii cursor forward, and the reset button to select. 2. When you see the wallpaper, or hear the start up sound. Press 1 and 2 on the wiimote simultaneously, to connect it for use as your mouse. When connected the LEDS will stop flashing, and only the first will stay illuminated. Plugging in a USB keyboard and or mouse will increase usability exponentially. Select "Configure WiFi" from the "System" menu and answer the questions. If you are using the Virtual Keyboard. Remember for your inputs to be registered. First click the "Focus" button on the keyboard. Then click on the whiite-ez-wifi-config tool window. If you are actively using a wiimote as an input device. It may take a few moments for WiFi to connect after wiimote first syncs. "wminput" the daemon that enables the wiimote to be used as a mouse, has a bug. If it is running and you don't have a wiimote synced WiFi may not work. If you are using a USB mouse; you can either connect a wiimote and let it sit eating batteries, or select "Kill Daemon" from "Wiimote" in the "System" menu. Instead of using a resource hogging desktop environment. EWL employs Joe's Window Manager, to provide an experience most users will find familiar. JWM features a start button in the corner of the task bar at the the bottom of the screen. It also has a pager to change between one of four virtual desktops. Dillo is a web browser built around the Fast Light Toolkit. Compared to other browsers it use a small amount of system resources. This means you can surf while using several other applications. Version 3.0.1 was compiled specifically for EWL. LostIRC is a fast and simple GUI IRC chat client. BitlBee is a daemon that routes instant messaging protocols to an IRC client. Using BitlBee you can chat over almost any messaging service with LostIRC. Right click a torrent file in emelFM2 file manager and select download. A download status window will automatically open. Your torrent will be downloaded to the folder containing the torrent file. Press "q" when your download is complete. Leafpad is a very lightweight GUI editor that allows for some font selection. fteapot is the FLTK GUI version of Table Editor and Planner. It is lightweight and has a large list of features. Including support for Lotus 1-2-3 WK1 file format. WK1 allows file transfer including formulas between fteapot and Excel. fteapot was built specifically for EWL. xclac is a full featured scientific calculator. epdfview is an easy to use lightweight PDF viewer. xzgv is fast image viewer that supports most formats. xpaint supports many image formats and has a lot of features. Think the little sister of GIMP or Photoshop. Launch xvkdb and you only need your wiimote. emelFM2 is a lightweight mouse driven GUI commander style file manager. Built specifically for EWL. Everything you could want in an editor. rxvt is very lightweight and is used as the default terminal. xterm uses more resources and is included to allow proper display of whiite-ez-wifi-config. This tool comes from debian-lenny-5.0+whiite-1.10.tar.bz2. Some small changes where made to it for EWL. 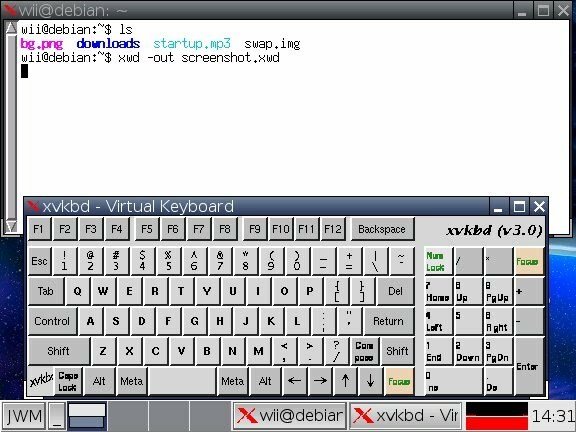 Using this tool and the virtual keyboard you can configure WiFi with only a wiimote. Kill and Start the mouse emulation daemon with a click. mount, unmount and eject disk with a click. Due to the experimental nature of the DVD driver. The DVD to be mounted must be inserted when EWL is booted. Also once it is unmounted, you will need to reboot before another disk can be read. Thanks to usbmount, drives using most file systems are automatically mounted on insertion at /media/usb0-7. Remember to unmount you USB drives before removing them to prevent data loss. There is a handy unmount button in the system menu. Because EWL is built on Debian Squeeze, adding new applications is a snap. You have access to the entire Debian Package Repository with apt-get. Right click a mp3 file in emelFM2 file manager and select play. xload is swallowed by the task bar to provide a persistent display of CPU usage. To permanently disable the wiimote mouse daemon. Comment out the wminput line in /etc/rc.local. To access the rest of the SD card comment out the umount lines in /etc/rc.local. SD card will be at /initrd/mnt. Leaving the RAM disk mounted to access the SD card will cost 4mb of RAM. There are more applications installed then just the ones listed in the Features section. (Examples: SSH server, bluez, more solitaires, ntfs-3g, etc.) Check /bin, /usr/bin/, /usr/games, etc. and all open source contributers. Edited 5 time(s). Last edit at 08/26/2012 06:15PM by linus. This distro is awesome! It works so quickly and smoothly. I wish I could get my WiFi to work. That's the only problem I'm having. I'd say that's a big one. Still, nothing. :( I wish I knew what was going on. I haven't even heard anyone comment on it here yet. Anybody there? First even after you connect a wiimote or kill the wminput daemon. It may take a few moments for the network to initialize. No more then 30 seconds in my experience. You can open the web browser and if it says DNS error on the bottom, just reload until it connects. Also if at the end of the wifi configuration tool it says network not enable dont worry. If you know the information you input was correct. Just restart and it should work. If you stil have problems you can post a copy of your /etc/network/interfaces and I can try and help you. If you have run the wifi configuration tool multiple times there will be a lot of commented out stuff in that file that isnt important. You can also try manually editing /etc/network/interface and replace "allow-hotplug wlan0" with "auto wlan0". If you are new to linux. Open the terminal. Then type "su" and press enter. When prompted for a password type "easy" then press enter. Finally type "nano /etc/network/interfaces" then press enter. To exit nano press ctrl+x. "SET failed on device wlan0 ; No such device"
then i ran the config tool again and it worked like a charm. with the kernel that works for you. For me, 576iPAL.elf works so i have moved that file to the bootmii folder and renamed it to ppcboot.elf (after backing up the original file ofcourse). Ah! That worked for me too, flits. Thanks for the suggestion. This distro rocks! I'm loving it. Scratch that. Now I just need to find out how to install Google Chrome (if possible) on it. Dillo is a really bad browser imo. Edited 1 time(s). Last edit at 11/25/2011 10:53PM by TeamFail. and i dont have enough knowledge to build it from scratch. (ip is listed as "inet addr", in my case 192.168.1.100). Then you can use your favorite ssh client, for example putty to open up a connection to your wii so you can remotely control it. This helped me a great deal, because i can simply browse the web while working on the wii and i get to copy/paste commands instead of manually typing them. This cleaned up another 85 MB and if you install any other programs in the future, all other locales will be automatically be purged. Running df -h again revealed that i now have 278M free. There is actually more free physical memory, but it is allocated to currently running processes. So when you run "free" you see only 3MB unused. This RAM can be reallocated without much if any system strain. I'm not sure how to accurately calculate the actual currently unused RAM, but from personal experience I'd say it is more like 20MB. If you want to stream videos why not just use WiiMC? You can also create more disk space(100MB), by moving the swap image to the root of the SD card and reconfiguring "/etc/rc.local". But you will lose the use of 5MB of physical memory to keep "initrd" mounted. 1) I remember Whiite Lenny did not support external USB DVD drives, so I had to recopile the kernel in order to be able to use it, does this version support it? If not, would it be possible to recompile it in order to do so? 2) If there's a swap partition on the SD card, will this version use it? No data collected so far on the use of external DVD drives. A swap partition on the SD card will not be recognized by default. EWL uses a swap file located in the users home directory. This can be reconfigured by editing /etc/rc.local. The FAT partition must be number 1. Sounds great. I'll give EWL a try. That did the trick and the USB DVD was fully operational from then on, of course I had the original kernel and Mike's patch to do it, If yours is a modified kernel (which I presume it is), then recompiling it with this option changed should work as well, I could give it try should you have the time to do it. Edit: I've tried the distro and the external DVD drive seems to work fine as is, but (there's always a but) I came across a different problem. "X: user not authorized to run the X server"
And never got to the JWM desktop again, so I ended up on the terminal. Any clues as to what happened? Is it not possible to update this distro? Edited 2 time(s). Last edit at 01/19/2012 02:06PM by mugre1975. Any way to download another browser?? Like a lightweight version of opera or firefox.? Also the torrent downloader doesn't work for me it keeps saying error is there an alternative? @mugre1975 I would assume that when you upgraded some of the sudo settings where reset. Try logging in as the user "wii" password "wii" not as root. Then run "xinit /usr/bin/jwm". Or if you are logged in as root. This is the command that is run during boot from /etc/rc.local (su - wii -c "xinit /usr/bin/jwm"). @Noe_misael You can try installing firefox or google chrome. Open terminal then login as root. Type "su" then press enter. The password is "easy". Once you are logged in as root, to install firefox "apt-get install iceweasel" or for chrome "apt-get install chromium-browser chromium-browser-l10n". Both of these browsers are resource intensive and for that reason where not included in the release. Check this list of BitTorrent clients. [en.wikipedia.org] Then use apt-get to install the one you want. I already overwritten the upgraded file with the original one, so this is what I'll do, I'll check /etc/rc.local for the command line you tell me that should be there before and after the upgrade. I'll perform again the upgrade as root and see whether that line is changed or not, if it is, I'll set it back the way it was and will try a reboot. If none of this works I'll try the upgrade as wii user. One more thing, is there a way to expand the image file from within the Linux evironment? OK here's what happened, somehow apt-get modified the allowed_users in /etc/X11/Xwrapper.config to "console"
Edited 1 time(s). Last edit at 01/23/2012 12:44AM by mugre1975. This procedure worked and I was able to boot with my new image file, but the X server permission problem appeared again, altogether with a "starting deferred execution scheduler: atd" error at startup. su - wii -c "xinit /usr/bin/jwm"
Using the new image file, I did the exact same thing but the command didn't accept the password "wii"
Any ideas will be much appreciated, I promise to post my modified file if I succeed! Like will3032840's problem I can't get wifi to work. I tried editing the "whiite-ez-wifi-config" file and the "/etc/network/interfaces" to no avail. Strange thing is that it did work the first time for a cuople of days and then suddenly stopped working! I've tried reinstalling the whole system and it still doesn't work. Also if someone could tell me how to view a log of what it says on boot up. That is all the writing that flashes past the screen as the distro is loading, is this information stored in a file somewhere? And what tools, if any, exist to help diagnose wifi problems. And is there a way to directly connect a usb mobile broadband modem to the wii and configure it to connect to the net? After playing around for a while I realised my problem was with the SDHC card. After using 'ifup' I got an "Input/ Output error" on the file 'ifstate'. I changed the sd card I was using and I reinstalled it from the beginning and I've had success... so far. Edited 2 time(s). Last edit at 06/09/2012 03:59AM by Snowy. I've been looking for a modern Linux distro for the Wii so I found this after googling "Wii Linux 2012". Great work! I'm rather impressed, much better than the other distro's I've used. Keep it up! The space limitation caused by the image is a big problem though, I was wondering if there's a way to have the system run off a real filesystem on an SD card instead of having it to load from an image.